Hope you enjoyed these cards as much as I had fun making them. Thanks for dropping by! Hi there! Today I created another card using my September Hero Arts Kit. The background was made in the same exact way as yesterday's card and placed on Ripe Avocado cardstock and a Kraft cardstock base. This time, I used the sunflower and stalk images for the focal point. The images are multi-step creating dimension. It was again stamped on Rustic Cream cardstock, rounded in the corners and blended with Distress Oxide Ink in Antique Linen. I stamped the sentiment on vellum and adhered that to the bottom of the image. The images on the left of the kit are just samples of what can be created with the kit. These projects are not included in the kit. The images on the right are the kit contents. It includes ink cubes, stamps, die cuts, assorted papers, and embellishments. 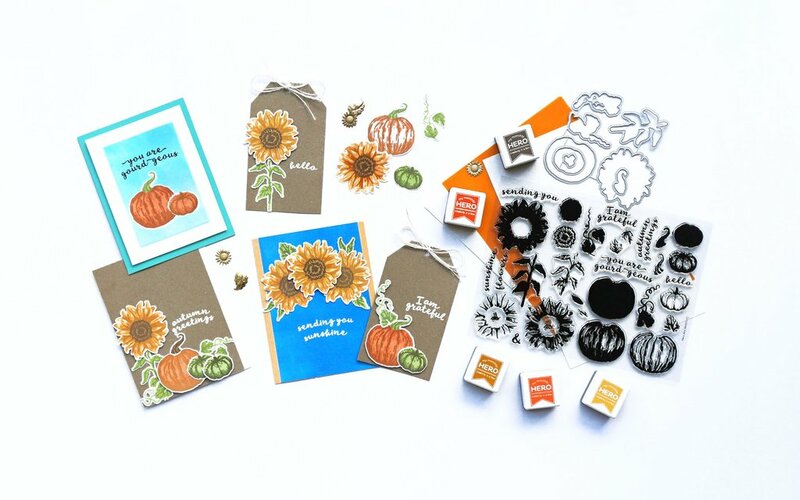 I die cut and stamped the pumpkin and leaf images from the September Hero Arts Kit. I stamped the sentiment "autumn greetings" in Tsukineko Momento Rich Cocoa Ink on Rustic Cream cardstock. I rounded the corners of the cardstock and blended Distress Ink Oxide in Antique Linen around the edges. Then I placed the pumpkin and leaf images on it with double sided foam tape. Next, I die cut a piece of Ripe Avocado cardstock with my Spellbinders Nestibilities die and blended the same color around the edges of the die cut. I adhered this piece under the Rustic Cream cardstock. To create the background, I used different images of my Leaf Prints stamp set and stamped various leaves in different colored inks (Orange Zest, Canyon Clay, Ripe Avocado, Simply Chartreuse, Dark Chocolate, Summer Sunrise) on white cardstock. I layered a piece of orange vellum (which was included in my Hero Arts kit) on top of the stamped background and then tied a piece of Rustic Cream baker's twine around the background piece. I placed this on Ripe Avocado cardstock and then adhered it to a Kraft cardstock base. Lastly, I added the rustic cream I made at the beginning on top of the background piece. I enjoyed making this Autumn card and can't wait to make more with my Hero Arts kit. Thanks for stopping in. Hi All! 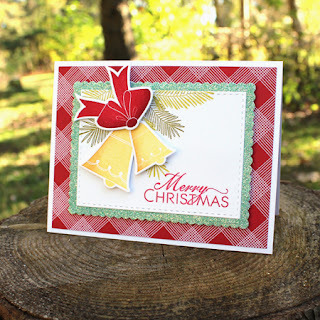 This week on Papertrey Ink's Make it Monday, Lizzie Jones shows us how to add bling to cards with glitter mats. I love how easy it is to make a simple card special by just adding a bit of glitter. Although working with glitter can be a tad bit messy, the result you get is well worth it. I had fun making this card. The most time-consuming and tedious was creating the cross stitch background. I die cut a piece of white cardstock with a cross stitch die and then used red, green, and white cross stitch floss to create a pattern. I added the sentiment "Merry & Bright" on top of the cross stitch piece using Ranger Multi Matte Medium. I find that particular liquid glue works best with the cross stitching. Then I placed the whole thing on top of a red glitter mat that I made using Scor-Tape and Martha Stewart Garnet Glitter. I embossed a piece of white cardstock with Stampin' Up Petals-a-Plenty Flowers Embossing Folder. I've had this embossing folder for years and usually take it out for Christmas cards. Still love it as much as the day I received it. I layered the cross stitch piece on top of the white embossed card stock and then placed the whole thing on top of a red card base. I love how it turned out! Leave a comment and let me know what you think of this. I decided where I wanted the placement of the letters and drew a light pencil line on white cardstock using a ruler. I stamped out the word "Merry" with the Botanical Letters stamp set starting from the middle letter and working my way out to get the correct spacing. Then I added a stamped "Christmas" sentiment underneath it. I used the Simon Says Stamp Wavy Scallop Stitches Wafer Die to die cut around the stamped words, and added some images from the Beautiful Berries stamp set. I also added a couple of bows to the second card. I've been playing with the Beautiful Berries set and have made other cards with it. It's definitely a great Christmas set to get and a good decorative addition to have. Thanks for stopping in and visiting today! I love watercoloring images. I'm not an artist, but I think watercoloring is very forgiving, especially when you emboss an outline image. Although you can use any watercolor paints you have on hand, I have two sets that I usually go to when watercoloring: the Kuretake Gansai Tambi Set and the Sakura Koi Watercolor Sketch Box. The Kuretake is my favorite with 36 bright opaque, creamy colors. The Sakura has 24 colors that are very pigmented and comes with a watercolor brush and a great mixing tray to extend the set. I used the Clearly Besotted Beautiful Friend stamp set and Versamark Ink to stamp the two flower images on watercolor paper. I embossed it with Wow White Pearl Embossing Powder and watercolored the images. When you emboss the images, you can contain the watercolor paint inside the image and not worry about it bleeding out of the lines. This makes it much easier for novices like myself. After the watercolor images dry, I blended the white spaces around the images with Tumbled Glass Distress Ink. I stamped the "Happy Birthday" sentiment from Beautiful Butterflies stamp set. I layered it on top of Autumn Rose cardstock then placed it on a White cardstock base. I stamped "MOM" with the Botanical Letter Stamp Set on white cardstock. I find it easiest to use a ruler and draw a light line with a pencil on where you want to place your letters. I always stamp the middle letter first and then work my way out for evenness in spacing. The pencil line can be easily erased after the ink dries. I used my Tombow Mono Sand and Rubber Eraser. This eraser is also great for erasing mistakes that you may make from accidentally transferring ink from your fingers to cards or light ink mark mistakes that you may make. It has two ends, a rough end and a smooth end. I use the rough end to take the pencil mark or ink out and then smooth it out with the smooth end. It won't take out full stamped ink images, just light ink mistakes or in this case, pencil marks. I also blended Abandoned Coral Distress Ink Oxide around the stamped letters. I used the large Brushed Off Oval Die to cut out the shape on Berry Sorbet Cardstock. I dabbed some Stampin' Up Rose Red ink onto the opening edges just to make it pop. I stamped some Wonderland Greenery with Stampin' Up Old Olive ink, Rose Red ink, Cameo Coral ink, and PTI Simply Chartreuse ink. I layered these on the top and lower edges of the oval shape. I stamped the "Birthday Wishes" sentiment from the Meadow Greens Stamp Set in the bottom right corner. I adhered this piece on top of the "MOM" image using double sided foam tape and then placed it on a white card base. After watching Jennifer McGuire's video on Stitched Cards, I felt quite inspired to experiment with cross stitching. I cross stitched with my Mom when I was little, so it brought back many happy childhood memories. Picking up a needle and thread to cross stitch was quite easy, and it was so nice to combine it with my love of card making. Although time-consuming, I find cross stitching very relaxing, and it gives my cards that extra special attention. I've been able to cross stitch when my boys have swim practice for about an hour every day. As Jennifer suggested, I carry my cross stitch materials in my Kangaroo Bag and pretty much bring it everywhere with me when I know I'll have some spare time. You can get the Kangaroo Bag and Pouch Set at DaySpring. The set comes with a bag and one pouch. I purchased extra pouches to separate different projects. Right now, they have an awesome sale going on for 25% off with the code "Family". Unfortunately for me, I purchased it at full price. But if cross stitching is something you're interested in, the Kangaroo Bag is great for storing projects you're working on. I used the Paper Smooches Cross Stitch Die to die cut holes on a 4 1/4 x 5 1/2 paper (Neenah Classic Crest Color Solar White 110 lb). I found that the more heavyweight paper works better for cross stitching to avoid any ripping, so go with an 80 lb-110 lb weight paper. I found a flower cross stitch design online and used it to make the flower. I trimmed down the cross stitch paper and placed it on an Americana cardstock base. I finished it with a "thanks" sentiment from Altenew. If I had to do it over, I'd probably use a different color for the sentiment. The black blends in too much with the dark blue cross-stitching. Overall, for my first card, it came out pretty good. I'm working on some Christmas cards right now so I'll post those as I finish them.